How to Make Besan Wala Naan/Batter Fried Naan. The title might have left your mind wondering what is Besan as some people are not familiar with the term Besan which is the same as Gram flour or Chickpea Flour; The flour produces by milling whole chickpeaas or Garbanzo beans. If you have gone through my other recipes you must be aware about my obsessesion with Besan, Gram flour or chickpea flour. The reason of my innate love for Besan flour is that I grew up in a culture where Besan four is a favorite and is widely used in a variety of dishes.This amazing flour has so many benefits and has lesser calories and less grams per Fat in each cup. Check out the following table to learn more about this awesome flour. Besan flour is derived from whole chick peas or garbanzo beans or split chickpeas which is also called grams. While reading about chickpea flour it revealed to me that this is also Gluten free by nature Which makes it a perfect flour for people with gluten intolerance. Some studies show that Besan is also proved helpful in lowering the blood sugar in individuals. Probably that is the reason in Pakistan and India people with diabetes are suggested to consume gram flour and even make their bread / chapati with it to help maintain their blood sugar levels to normal. 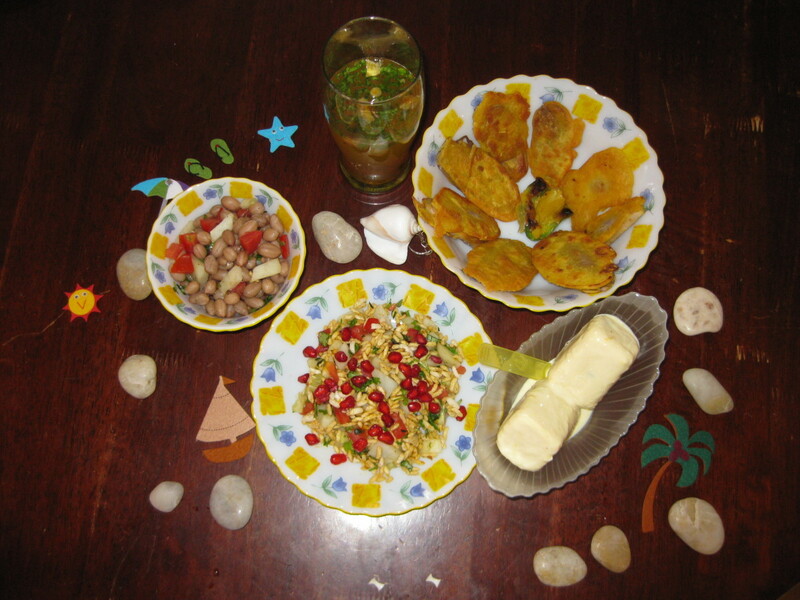 Check out the following article about Besan/ gram flour. There are many amazing health benefits of this naturally gluten free flour that is widely used in South Asian cuisine. Let us talk about few of the benefits of chickpea flour also known as Besan flour. 2 Naan bread, Left overs or frozen cut them in pieces with a knife. 1/4 tsp Fenugreek leaves dried, Or methi leaves ( optional). Cut the pieces in halves or if naan is round shaped then four pieces will look good. Sometimes naan comes in oval or triangle shape so use your imagination to cut naan into presentable pieces. I sometimes use left over Naans or frozen ones right out of the freezer. Put the pieces of naan on a side and take a mixing bowl. Add besan flour and add about 3/4 cup of water and mix if need more water then add some more but do not make the mixture too runny. 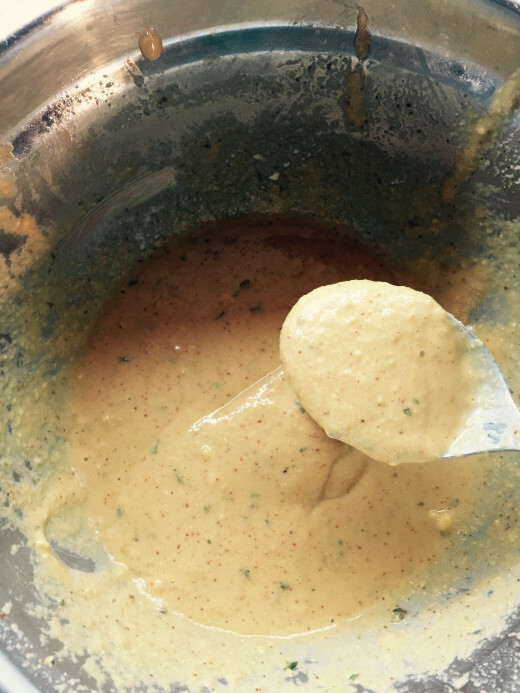 Use whisk to mix the besan flour and all the spices including salt. Heat oil in a wok , kadahi ( I use a heavy bottom kadahi for deep frying ) or deep pan and turn the heat to medium when it reaches the appropriate temperature for frying. 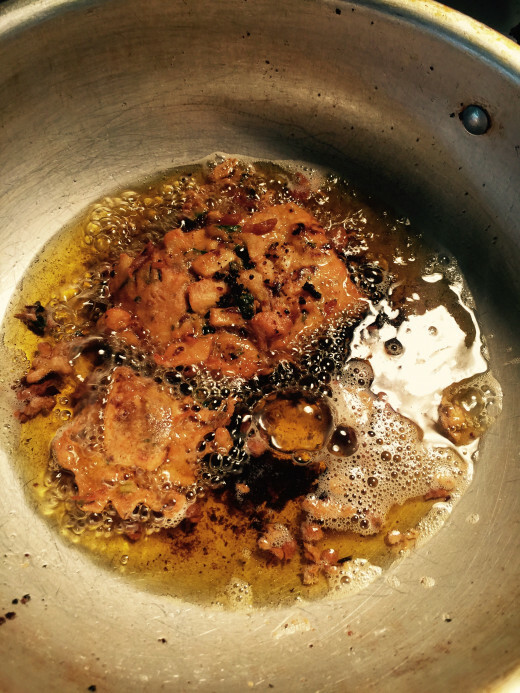 Now coat the pieces of naan into the batter and drop one by one in the oil and let cook for one minute on each side. Make sure the pieces of naan are light brown and crispy before taking out. Naan cooks fast so make sure not to make it too crispy. Just cook it on medium flame for about two minutes; one minute on each side and it should be done nicely. Use a slotted spoon/ spatula to take out the pieces of naan and place them on a dish lined with paper towel. 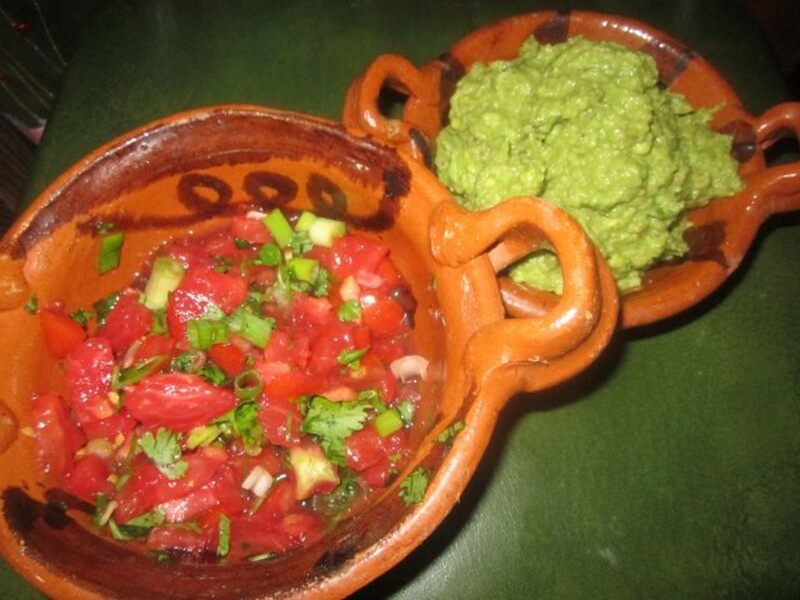 Serve with chutney or hot sauce as an appetizer or give in lunch boxes. Do not use olive oil for deep frying. Canola or vegetable oils works the best for that purpose. Besan flour has the tendency to make lumps while making batter with besan flour make sure all lumps are dissolved by either sifting the flour first or beating very well with whisk. Do not cook naan for too long As it can make naan chewy and hard. 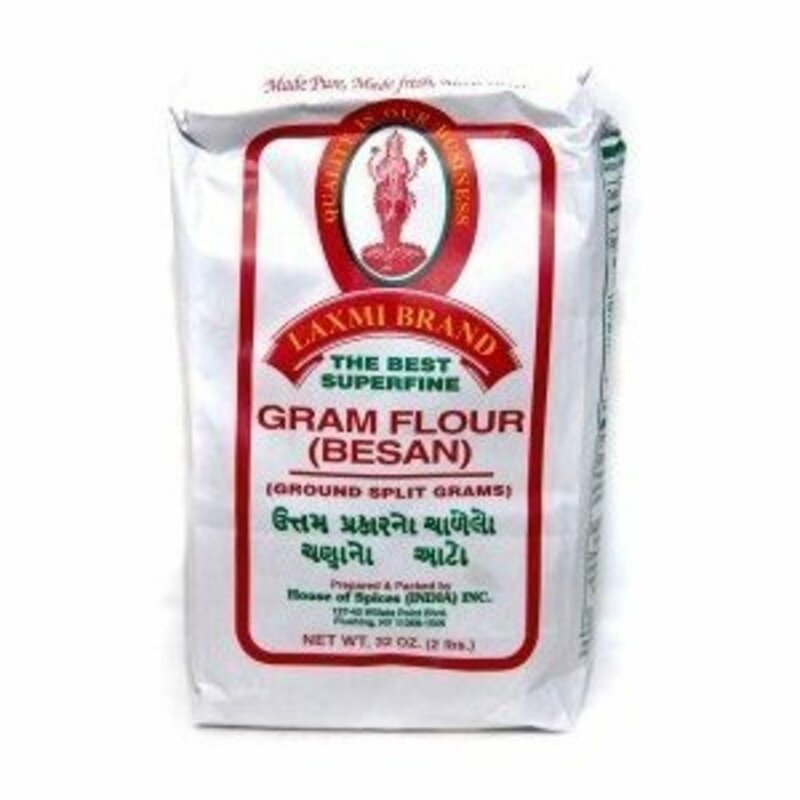 This Besan flour is the best one and is much cheaper on Amazon. Nutrition Facts for Besan (Chickpea Flour). 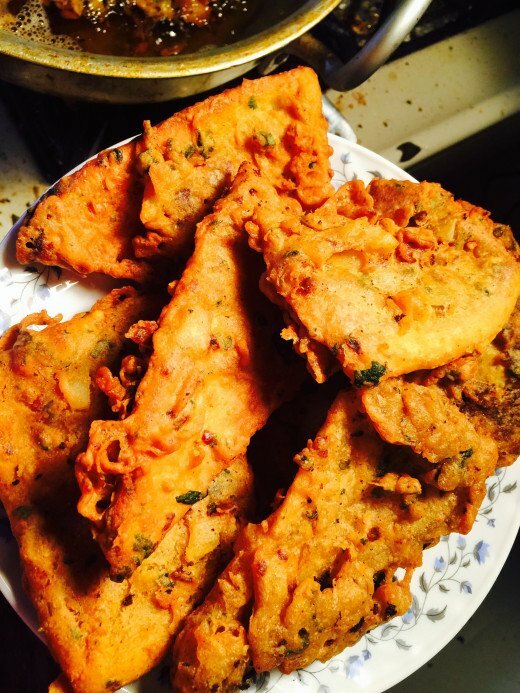 For more recipes of Besan flour check out my other hubs. 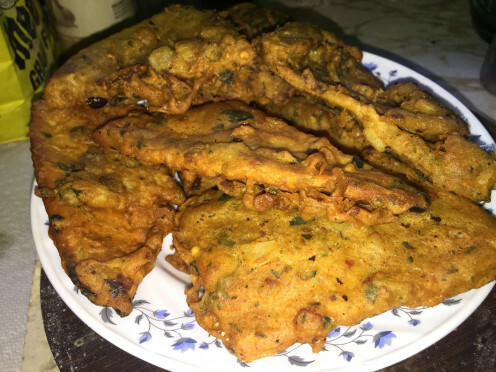 Crispy fritters made with Gluten Free Gram flour ,spinach,potato and spices served with mint chutney.Gram flour fritters or Besan Pakora is the most popular dish of Iftaar/Ramdan and all year around. Crispy yet soft on the inner side plain pakoras are a great appetizer made with Gluten Free Besan flour aka chickpea flour .Quick to make with few ingredients plain pakora is simply delicious. Tasty snack recipe of eggplant or baingan cutlets in naturally gluten free gram flour batter deep fried until they are crispy. Eggplant pakoras are a great tea time snack or a starter to any meal. Apple Pickle Recipe - An interesting story! thanks peachpurple you may get it online its available on both amazon and ebay. So glad to know. Sehar ! Sehar that is what it is inspired from. I really miss that chabri Wala naan so went into wondering how they make it and came up with this recipe. The taste is exactly like the one we used to eat as kids in Pakistan. I guess you too am I right ?